The cHiPLC® system is a chip-based platform that, in combination with the nanoLC 400 system, delivers superior sensitivity, column-to-column reproducibility, and exceptional ease of operation. 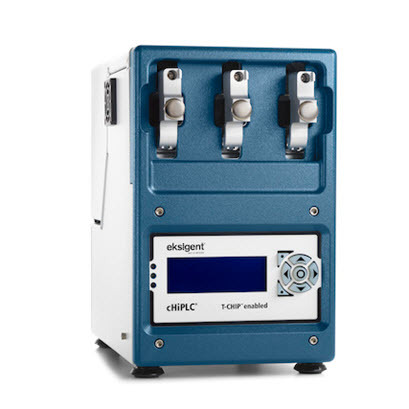 The cHiPLC system is a "docking station" for up to three microfluidic chips. The system's flexible design and built-in 10-port nano valve allow for easy switching between different types of experiments such as direct injection and trap-loading. Chips containing a nanoLC column, microLC column, or trap column can be exchanged in seconds. A perfect dead-volume-free connection is made every time as the cHiPLC column or trap column is automatically aligned with a special connector chip. All alignment is achieved through the use of highly reproducible microfabrication techniques similar to those used in the microelectronics industry. Additionally, these techniques are used to define fluidic paths and to create a microfabricated weir structure for stationary phase particle retention. Chips are temperature controlled to guarantee reproducible retention times and improved separations. Special care has been given to the design of both the trap-chips and analytical column-chips in order to achieve separations that are equal or better than separations obtained using packed capillaries (see Figure 1). The use of fused silica allows for cylindrical channels for packing nanoLC columns and traps. Instead of conventional frits made out of fused stationary phase particles, our cHiPLC columns use a unique weir structure to retain the stationary phase particles in the column. These weirs are more reproducible to fabricate, while their dead-volume is virtually zero (~13 pL). In addition, adsorption of sample components that can occur with frit material is not an issue with these types of structures. Figure 1. Comparison of the separation of a peptide test mix on a nano cHiPLC column and a conventional nanoLC column. Both columns are 15 cm x 75 µm, and packed with ChromXP C18-CL 3 µm 300Å. Flowrate is 250 nl/min; gradient slope 2% acetonitrile/min. Connections to and from each chip are made using a patented connection system that can connect up to seven channels to the outside world with a dead volume of less than 1 nl. The force used to connect the chip is pre-set, so that every time the user exchanges a chip, a leak-free connection is obtained without any required user adjustments. Besides the ease of replacing a nanoLC column or trap in seconds, the use of our cHiPLC columns also increases column-to-column reproducibility. All chips are exactly identical, and our packing procedure guarantees the best possible column-to-column reproducibility in nanoLC (see Figure 2). This is of importance for applications where retention time stability over longer periods of time and over multiple columns is important. Examples are the use of retention time in combination with accurate mass in peptide/protein identification and scheduling MRMs for peptide quantitation in biomarker validation. Figure 2. Excellent inter-column reproducibility is achieved for a peptide test mix between three 15 cm x 75 µm nano cHiPLC columns packed with ChromXP C18-CL 3 µm 300Å. Flowrate is 250 nl/min; gradient slope 2% acetonitrile/min. The cHiPLC-nanoflex allows for easy switching between direct injection, trap-loading and dual column with direct injection experiments. This is achieved through the use of a fluidic jumper chip, which routes fluid appropriately for the desired experiment. This jumper chip is as easily changed as the column and trap chips. In addition, the cHiPLC-nanoflex can be used in combination with all Eksigent nanoLC systems along with any mass spectrometer/nanospray source.